B2B commerce in the U.S. is a big deal. The most-recent U.S. Census Bureau survey on the topic reported in 2008 that B2B commerce accounted for 52% of total commercial activity, and B2B e-commerce accounted for 92% of total e-commerce. B2B marketing in the U.S. (also) is a big deal. B2B marketing represented 35% of total spending on marketing and advertising in the U.S. in 2010 – to the tune of $129B – according to research firm Outsell. In fact, you might even make a credible argument that much of the innovation at a people, process, content and technology level in the overall marketing discipline, today, is primarily taking place in the B2B marketing and sales segment. Definitely more than in the consumer marketing arena. Yet it seems more difficult than ever for B2B marketing and sales leaders to get the education and peer insight they need to stay ahead of their game. And, whereas the consumer world seems to have a real ‘esprit de corps,’ the idea of ‘community’ in the B2B marketing and sales world is a rare thing. … which is why I’m so excited about the first-ever B2BCamp (Twitter: @b2bcamp, #b2bcamp #atl) in Atlanta this coming Saturday, March 10. Billed as an ‘unconference,’ the event is squarely targeted at delivering the type of education, peer insights and community that too often seem to elude B2B marketing and sales leaders. I’m also excited to be keynoting the event – giving a talk that is based on my book, Balancing the Demand Equation, and that frames up the day by talking about the larger set of challenges and opportunities facing B2B demand generation today. B2BCamp is a user organized gathering focused on B2B Marketing topics. B2BCamp is one of many “unconferences” held throughout the world. Although similar to traditional industry conferences, at B2BCamp there are no “attendees” because everyone participates in some manner. Some participants will present while others will lead a roundtable discussion. Some will contribute simply by sharing their experiences and others by helping with logistics, securing sponsorships, setting up Wi-Fi, etc. B2BCamp is a self-organizing collaborative event that is rewarding, fun and a totally cool experience! And if it’s not 100% apparent, B2BCamp – despite a focus on the topic of B2B commerce – is in fact not a commercial event. I.e., all of the organizers are volunteers, and sponsorships are set at a low level … just enough to help cover costs. A key feature of B2BCamp is that the agenda is developed by the attendees via two rounds of voting – before the event to narrow the presentations and on-site to finalize the agenda. In fact, you can review the proposed sessions and vote online here. BTW: At the time I’m typing this blog post the top session is “Welcome to the Buyer-centric Movement” – a topic I love because it’s literally one of the two guiding concepts in my book. Not only is this unconference transparent about selecting the sessions, it’s also transparent about who’s attending. To find who’s attending, click here. As I mentioned above, the event is this Saturday, March 10, near the Perimeter Mall in the Atlanta area. The event organizers tell me there are 175+ B2B marketing and sales leaders already registered, and so it’s likely to be a sell-out. Should be a good first step towards building a (much-needed) B2B marketing and sales community … in the Atlanta-area, and then around the country as B2BCamp hits the road! TBD. That bigger issue is B2B marketing leaders’ lack of an operations mindset. This is the issue that B2B marketing leaders – especially CMOs – often can’t put their finger on, but that is at the core of much of our modern challenges. They talk about not being able to demonstrate the revenue impact of marketing; they talk about not having ‘hard numbers’; or they speak to not having a dashboard to really visualize marketing results. Obviously none of these ‘wants’ represent an operations mindset, per se, but they do represent the result of successfully managing demand as a process. The disconnect: If as B2B marketers we are applying legacy mass-marketing, top-of-funnel techniques to the effort of customer acquisition and nurturing in an era of Buyer 2.0, there is a high likelihood that we will have a single, ineffective touchpoint with our buyer and then subsequently lose his/her engagement as (s)he goes through the buying process. Most of our demand generation programs thus remain highly inefficient, largely focused on awareness, and so we consistently lose track of warm leads that literally ‘leak’ out of our sale funnel, as Forrester has noted in its research. This is particularly problematic because Buyer 2.0 is moving forward in the buyer education process and will make a purchase, but if our B2B demand generation program loses touch with that buyer, the chance of him/her purchasing from us is greatly decreased. Most B2B marketing organizations thus do not have a top-of-funnel problem. What they really have is a ‘middle-of-the-funnel’ problem. Yet it is exactly this type of a consistent and continuous B2B demand process – one that perpetually operates to move a buyer through multiple education and qualification stages (adjusting to the pace of the buying cycle), that combines both automated and live touch points and that only turns a lead over to sales after sufficient processing – that B2B marketing leaders are challenged to build. What is at the core of this issue? It has nothing to do with good intentions; rather, it is the product of biases that are deep-rooted and fundamentally engrained in B2B marketers. First, right-brain/creative types are often drawn to marketing, not left-brainers. Second, marketing training at the vocational and academic level is focused on channels and tactics and on building consumer brands, but rarely speaks to the orchestration and coordination of multiple channels and tactics in a sequence to drive buyer dialogue. Third, on the off-chance a B2B marketer has some operations-analysis experience, it was probably garnered either in an MBA class or in an industrial setting, and it was probably applied to some sort of manufacturing process – meaning it never ‘clicked’ that this could also be applied to marketing. Fourth, the opportunities and challenges around such a complex, iterative and information empowered Buyer 2.0 are relatively recent; meaning, it truly is a changed world of marketing today from five years ago or ten years ago, when more ‘one-and-done’ tactics in more limited channels might have actually been a successful route. It’s time for our training, bias and ultimate mindset as B2B marketers to catch up with our operational reality. So where do we need to focus our time and attention to drive change? 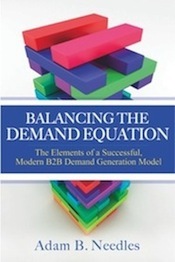 I open Balancing the Demand Equation by commenting, “Modern B2B demand generation is failing. Seriously.” What’s going on? Amid an information power shift from sellers to buyers, an explosion of Web 2.0 communication channels and raised expectations from sales colleagues and executive management, B2B marketers are finding it tougher than ever to credibly and efficiently add value in the “lead-to-revenue” process, as Forrester terms it. I hear this challenge regularly from senior marketers and CMOs, who often are hard-pressed to show the real impact of their efforts on their companies’ bottom lines. There are many challenges, but perhaps one of the greatest is our frequent inability as B2B marketing leaders to conceptualize and manage ‘demand’ – used here in the classical economics sense of the word – as an operational, repeatable and sustainable process. Stated in another way, we do not treat B2B buyer demand as something that is built via a series of optimize-able steps, through which we turn initial buyer interest into a lifetime of customer revenue. What goes into such an end-to-end demand process? The core organizing thread is the logic around the dialogue we plan to drive with the buyer, based on his/her buying process. This aligns with a virtual ‘layer’ of content marketing efforts that should extend across channels, addressing various stages of the buying process. This dialogue also should be aligned with a layer of lead qualification activities, which extend throughout all phases of the buying process. These parallel layers of content marketing and lead qualification should align with various marketing and sales roles, spanning both automated nurturing and also live interaction at various stages of the buying process. And the entire process should be supported by data and systems that enable the end-to-end orchestration of marketing and sales efforts to move the buyer forward. Active demand process management thus is critical to successful, modern B2B marketing and demand generation, and yet B2B marketing leaders are only beginning to scratch the surface of doing so. Clearly modern B2B demand generation is failing. And all of the great messaging and creative, smart tradeshow sponsorships and new technology investments that we throw at the problem cannot help if we are unable make a critical leap. We must be able to manage demand as an operational process. So why haven’t we done this yet?